GridPlay resources and customisation service for special needs are the fruit of many years of research into the use of MIDIgrid as a creative resource at all levels of ability. We have prepared resources for use from pre-school to adult/further education levels, including resources for users with a whole range of disabilities. MIDIgrid is music software with sophisticated facilities for the creative musician to create and play virtual instruments, improvise & compose, make multi-track recordings and create their own interactive teaching resources. Yet, in performance mode, it has a simple enough interface to allow exploration by the youngest or most disabled user. 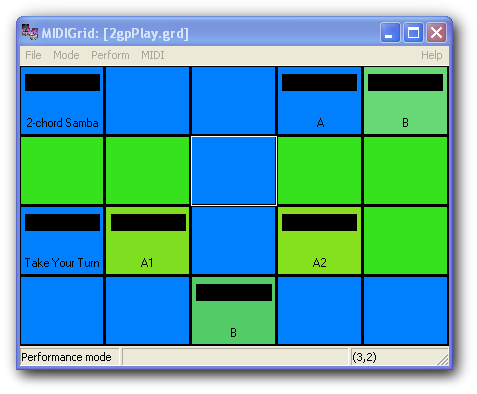 GridPlay is a performance only version of MIDIgrid. It functions as both a musical instrument that you can play with a mouse or trackball and a music player allowing rapid selection of musical items stored in the grid. The Full Pitcher publishes GridPlay with sets of files, or 'grids'. There are grids optimised for switch input, grids which have repeatedly elicited responses from our most profoundly disabled users and grids which have enabled disabled youngsters to join talented able-bodied friends in performances at concerts and music festivals. GridPlay for Carers/teachers takes the most successful repertoire and activities, developed in special needs workshops over a period of 35+ years, to make available a package of resources with which carers or teachers can confidently initiate and sustain musical activities with severely disabled people. GridPlay is a read-only version of the remarkable MIDIgrid software and the latter has been used to create ‘Rollers’ and ‘General Purpose’ grids, each grid a mini-application. ‘Rollers’ are instruments which can be played with a mouse, trackball, joystick or a wide range of switch-systems, while the ‘General’ grids provide recorded repertoire, themed according to the activities they support, for ongoing music sessions. The 43-page printable e-book offers copious suggestions for using the grids, lyrics, sheet music for a number of items, and advice on running music groups for people with profound disabilities. The Full Pitcher offers a post-sales customisation service for this product. We can also prepare you a custom CD of GridPlay files, selected to match the ages and degrees of disability of your users. It's All a Bit Fishy!